Roman Kharkovski personal blog: "Psychology of Human Behavior"
Recently I borrowed the lectures "Psychology of Human Behavior" by Professor David W. Martin from my local library and while I run listen to these. Fascinating stuff. Learned a ton of new things about human psychology, human nervous system, Freud and his psychoanalytic theory, mental illnesses, depressions, and bunch of other cool stuff. Total of 18 hours of lectures. For example, yesterday while I was running on the trail in the woods the lecture #13 was about psycho-surgeries, lobotomy, electric convulsive shock therapy, future gene therapy and things like that. The further along I get in this course - the more interesting it gets. 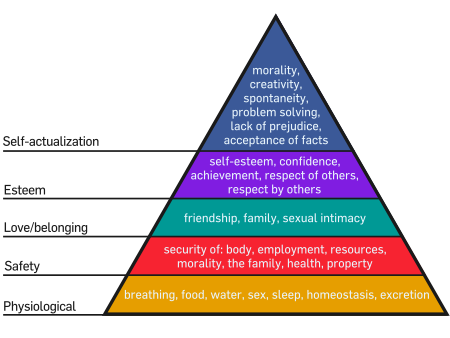 The lecture18 on human motivation talked about the Maslow pyramid of human needs as well as other theories of human motivation. Lectures 19 and 20 are on human emotions and how to measure those as well as different theories that explain emotions and their "mechanics". It was quite interesting to learn about the experiment by Edward Diener who conducted an experiment on 1.1M people worldwide and found that on average people are rating themselves happy at about 6.5 on 0 to 10 scale - regardless of their income, health, geographic location, etc. Quoting wikipedia: In 2002, Diener conducted a study at the University of Illinois with Martin Seligman, finding that "the most salient characteristics shared by the 10% of students with the highest levels of happiness and the fewest signs of depression were their strong ties to friends and family and commitment to spending time with them... It is important to work on social skills, close interpersonal ties and social support in order to be happy." Diener's research showed that once a person's "basic needs are met, additional income does little to raise your sense of satisfaction with life." Lectures 21 and 22 discuss different drugs (marihuana, alcohol, opium, crack, cocaine, LSD, depressants, etc.) and how these drugs work at the neuron level, withdrawal symptoms, and other effects of drugs on humans. I must admit to have learned quite a few interesting things about drugs, for example the fact that the TI (therapeutic index) of alcohol is about 5, while TI of marihuana is about 35,000. What is TI? In simple terms it is the ratio of lethal doze to the therapeutic doze. In other words if you drink 5x the amount of alcohol compared to the amount to get you "well drunk" there is about 50% chance you may die (i.e. 6-10 glasses of vodka can kill you depending on your tolerance level). Take a set of CDs from your library and that should give you plenty of time to listen. Here is a description of the course: http://www.thegreatcourses.com/tgc/courses/course_detail.aspx?cid=1620. If your library does not have this, you can get these lectures from Amazon. The Teaching Company (they are now called The Great Courses) has lots of other great lectures and your library probably has some good ones. what a wonderful blog you have,its very informative and useful. being human we all have different kinds of behaviors and sometimes we cannot control ourselves but we need to be careful and be watchful of our attitude..